MAZ, whose publishing platform powers over 600 apps on the Apple App Store, Google Play and Amazon Appstore, unveiled a study today showing how users are sharing content from tablets. Apps created with MAZ include a unique feature called Clippings that allows users to "cut out" anything that they see on the screen to save or share via email or social media. The most interesting finding of the study was the fact that 72% of all shared content is shared via email. While a lot of digital strategists have written off email as an outdated tool compared to more modern social networks, the data suggests that despite being presented with the option to share to Facebook, Twitter, Pinterest or Tumblr, users continue to prefer sharing content to their friends, family or coworkers via email. With the recent buzz about young people moving to closed networks such as Snapchat, this study supports the idea that sharing to individuals and smaller groups may be preferable over public-facing networks. As for social networks, the study shows that users prefer to share to specific social media platforms depending on the category of app. 72% of all sharing is via email. Lifestyle app users are 7 times more likely to share to Pinterest than to Twitter. Business app users are 6 times more likely to share to Twitter compared to Lifestyle apps. Sports app users are twice as likely to share to Facebook compared to Lifestyle apps. Entertainment, Sports, and Travel app users share to Facebook more than any other social network. Business app users share to Twitter more than any other social network. 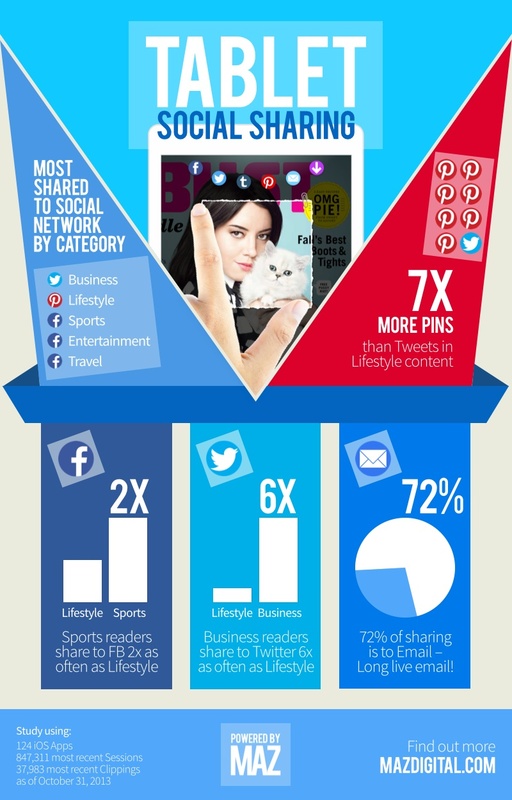 Lifestyle app users share to Pinterest more than any other social network. The study was done using aggregated data from 124 iOS apps, 847,311 user sessions, and 37,983 Clippings.